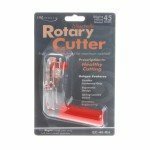 Cutter fits in a natural hand postition and is engineered for easy maneurverability. Hand pressure points are evenly distributed when cutting. Hand placement requires less pressure when cutting. Great for those with arthritis, carpel tunnel syndrome, tendonitis, hand fatigue, neck arm pain. Has automatic springloaded guard. Flips guard open with finger or rolls open on mat.